Bioswales are shallow, open channels that are designed to reduce runoff volume through infiltration. Additionally, bioswales trap trash and remove polllutants such as some chemicals by filtering water through vegetation and soil within the channel. 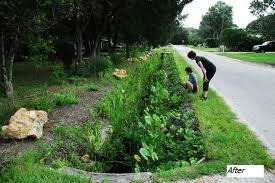 Swales can serve as conveyance for stormwater and can be used in place of traditional curbs and gutters. The primary objective of a bioswale is infiltration and water quality enhancement rather than conveyance. However they can convey stormwater volumes to a discharge point, but unlike ditches, they intentionally promote the slowing and filtering of polluted runoff along the way. In addition to reducing the mass of pollutants in runoff, when properly maintained, bioswales can enhance the aesthetics of a site. Bioswale vegetation is typically lawn grasses, but many low-volume swales are now being built with a combination of grasses, perennials, shrubs, groundcover and trees. A typical swale bottom is flat in cross section, 600 to 2400 mm wide, with a 1-2% longitudinal slope, or dished between weirs on steeper slopes. Bioswale side slopes are usually no more than 3:1, horizontal to vertical. 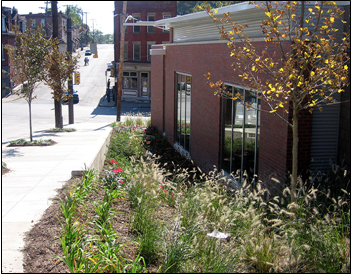 Pruning 1-2 times/yr Nutrients in runoff often cause bioswale vegetation to flourish. Mulching 1-2 times/yr Recommend maintaining 1"–3" uniform mulch layer. Inlet inspection Once after first rain of the season, then monthly during the rainy season Check for sediment accumulation to ensure that flow into the bioswale is as designed. Remove any accumulated sediment.